This is a sequel to Dodge Bouncing Balls. In this game, Alliteration Parley must puzzle out the identity of each of the bellyballs on screen. Use the sonar, carefully observe their responses, and then tag them with the correct colour to win. This is inspired by Liquisity, Pac-Man, Hundreds and Finderseek. Click - Select weapon, use weapon. I got the idea for this game from the title of Kenta Cho's new game Deadly Balls Bounce. The game itself is inspired by Hundreds and Minesweeper. 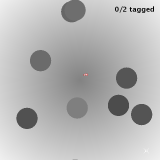 Left click - Tag ball. Tag only the dangerous bellyballs to win the level. 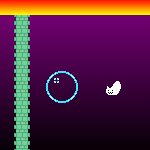 The dangerous bellyballs bounce off the edges of the screen, whereas the harmless ones wrap around. Made in Game Maker, because that's how I roll.